The end of the asparagus season is approaching, last chance to post one of my favourite starters including this succulent vegetable. This recipe – or let’s rather call it an ingredient list – is prepared in 15 minutes, is bursting with health thanks to the asparagus and the poached egg and has an absolute WOW factor – one of my favourite dishes to serve at a dinner party or when in a rush. I’ve encountered versions of this dish in several restaurants. Whenever someone ordered it, I was looking at it with a jealous eye and wondering why I hadn’t ordered it myself. Was it too easy? I guess so! Could I do it myself? Of course!!! 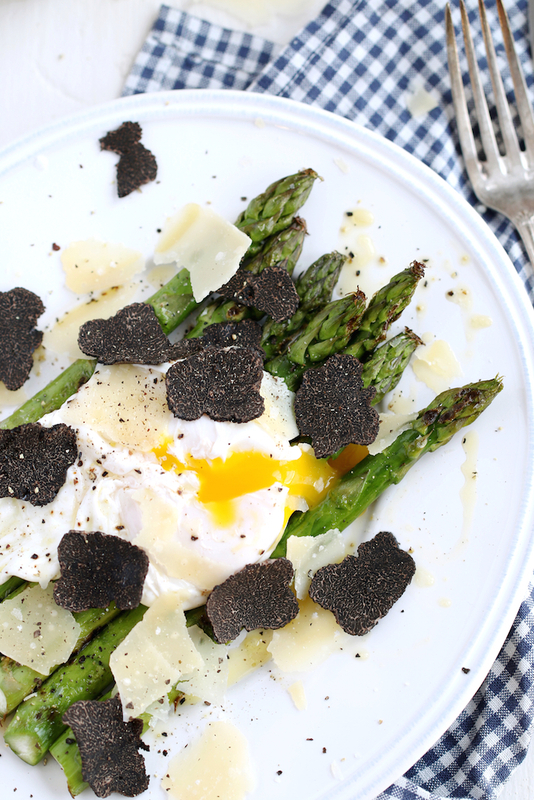 When grilled asparagus meets a runny poached egg, parmesan and truffle shavings it is bound to be a love affair. A dish so easy to make but absolutely extravagant in every sense… For best results, use the finest quality ingredients you can find and don’t overcook the asparagus and poached egg. You will be delighted with the result! If you can’t find good truffle or want to make this dish a bit more wallet-friendly, you can drizzle some truffle-scented olive oil on top or use tartufata – a black truffle and mushroom sauce – which i’ve encountered a lot in Croatia. Palmižiana – an inhabited island with a port. Anchoring just in front of the Laganini Lounge bar & Fish House, where we spent most of our time. The fish, seafood and drinks were just phenomenal – a little ibiza-ish. The Lighthouse on Sušac – staying overnight in a lighthouse on a remote island with endemic species of birds crying like babies and a drunk lighthouse keeper trying to get into our room might sound a bit scary… well it certainly was… but I would go back anytime! The Croatians love their truffle, so do I, and made sure I came back from vacation with lots of goodies such as truffled sheep’s cheese, truffle oil and, of course, tartufata. What does the asparagus do for us? Asparagus is low in calories, high in dietary fibre, has a low glycemic load and is know for the detoxifying properties (great for loosing weight!). In addition it is loaded with nutrients such as vitamin K, vitamin C, vitamin A, B-vitamins (folate, riboflavin, nacine…) and minerals. Supports a healthy gut: inulin – a prebiotic – promotes the growth of our gut friendly bacteria such as Bifidobacteria and Lactobacilli in our large intestine. They in turn improve our nutrient absorption, lower risk of allergy, and lower risk of colon cancer. Besides inulin, the fibre and protein found in asparagus preserve our digestion and will move food through our gut at a beneficial speed. Energy boosting: B-vitamins help the conversion of food into fuel which gives us energy. Fibre regulates our blood sugar levels so you won’t experience a blood spike. In addition, excessive ammonia (can make us feel drained) can be neutralised by the aspartic acid in the asparagus. 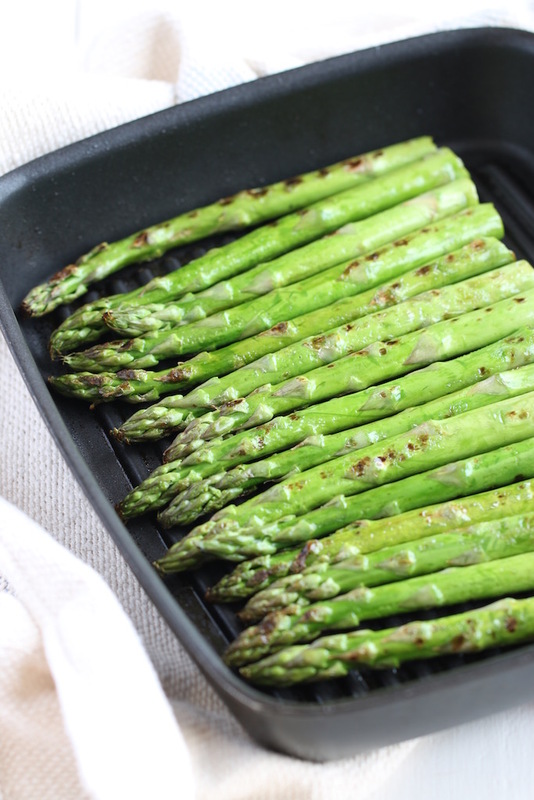 Anti-inflammatory and antioxidant benefits thanks to various nutrients in the asparagus.These can help us reduce risk of chronic health problems along with certain cancers, fight free radicals and support our immune response. Healthy skin: Vitamin A plays a central role in the integrity of our skin. Vitamin C, on the other hand, is an essential cofactor for the synthesis of collagen, which is important for epidermal elasticity. Bone Health: Around 6 medium sized asparagus spears cover your daily need of vitamin K – essential for the health of your bone structure. 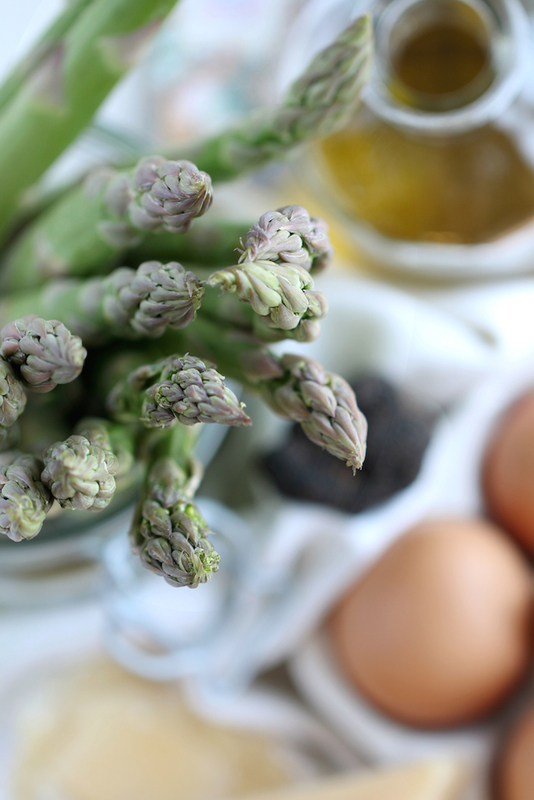 Adding fat such as an egg or olive oil to the asparagus will help your body absorb this important vitamin, which can also regenerate vitamin E – the most important fat soluble antioxidant. Adding an egg (a nutrient powerhouse) to your asparagus will not only taste incredibly delicious but also add loads of nutrients to your dish, hence make it very nourishing and will keep you full and happy for longer. Read more about the health benefits of eggs in my ‘The Perfect poached Egg’ post. Use your asparagus soon after purchase! Asparagus has a high respiration rate (basic reaction of plants: intake of oxygen; break down of sugar and starches; release of carbon dioxide) which makes them highly perishable; it is therefore important to consume them within 48 hours of purchase. In order to counterbalance this process, wrap the end of the stems in a damp cloth and store in the refrigerator. Grilling and roasting will keep more of the nutrients! Steaming or boiling asparagus will extract loads of minerals into the water while cooking, plus you run the chance of overcooking them. Buy in season to get optimal use of the nutrients. The season starts in February and ends in June. Heat your grill pan on high heat. Add the asparagus and grill until cooked but still crunchy – check with a knife. In the meantime poach the egg. 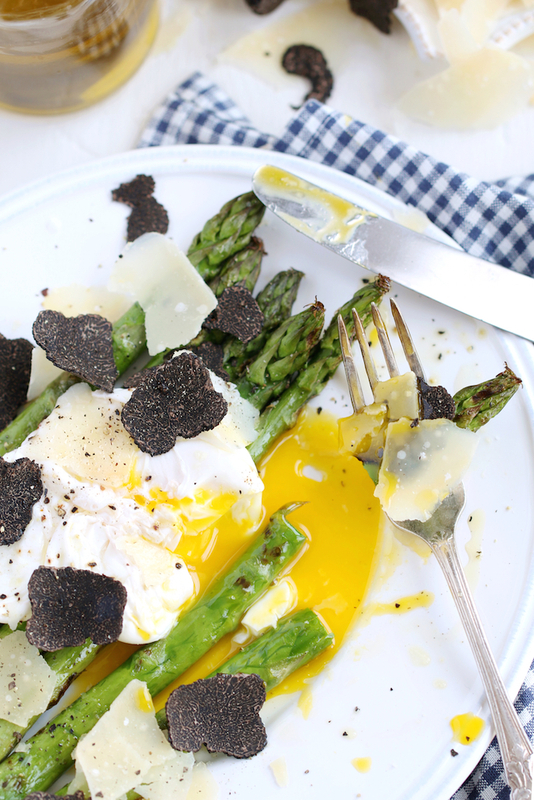 Divide the asparagus on two plates, carefully lay the poached egg on the spears, drizzle with olive oil, scatter the Parmigiano and truffle shavings on top followed by some black pepper and salt. Make it wallet-friendly: instead of the fresh truffle shavings you can use tartufata – a black truffle and mushroom sauce – or exchange the olive oil with truffle-scented oil. Make it more rustic: exchange the truffle with some crispy bacon. Make it vegan: exchange the poached egg with a vegan fried egg from ‘One Green Planet’ and the parmesan with a vegan alternative such as on the one from ‘The Minimalist Baker’. Make it a main course: Just double the quantities of asparagus and eggs. Burgerstein Handbuch Nährstoffe; Healing Foods; SELFNutritionData, the world’s healthiest foods, University of Maryland – Medical Centre, Châtelaine. This entry was posted in Food, Food Photography, Food Styling, Health, Recipes and tagged asparagus, dairy, detox, egg, indulgence, photography, salad, vegetarian by Françoise La Prune. Bookmark the permalink. I never really thought about putting poached eggs with asparagus. This is spectacular! Beautifully presented and photographed! I love Asparagus, and poached eggs. I’ll have to give this a try. Thank you very much… You’ve got to try it! It’s so simple, delicious and good for you! What else do you want?!? 😀 happy blogging! This looks so delicious and summery – can just imagine the taste of those wonderfully umami flavours. I’m addicted to truffle too shall be trying this out asap! Looks tasty, and great photos. Thank you so much! 😀 I think it even tastes better than looks… 😉 you’ve got to try it! Are you visiting the Island of Pag during your Croatian Trip? No we did’t visit Pag but Korčula, Mljet and Hvar instead. All were so lovely. I really can’t wait to go back. Have you visited the Dalmatian Coast? Like this recipe. Great combination! I confess the parma ham idea is definitely appealing! I’ve never eaten truffles – could you replace them also with cep mushrooms I wonder?